With more than 1.5 million apps and counting, finding what you want or need for your mobile device is an easy search and download. Looking for the nearest Starbucks or Panera? Need a flashlight, mirror or magnifying glass? Want to track your stocks or calories? Absolutely, you can find an app. Most apps are free, and your device can hold thousands of them though most of us have a lot less on our devices. One-third of U.S. smartphone users who download apps have 11 to 20 apps on their device, according to the Pew Research Center. But about half of them use only one to five apps a week. Apps are easy to delete, so spend time with the “search” screen to peruse your interests, or find new ones like chess or coloring. 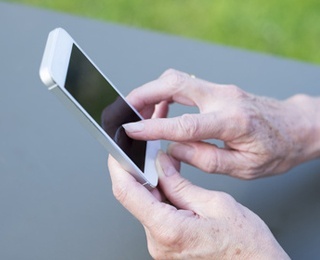 Here are three popular topics for older adults with apps to get your started. On the road and you’re looking for the next rest area or restaurant. The iExit app takes away the guessing and let’s you plan stops miles away. Probably your favorite restaurant has an app too, which always makes for a more enjoyable trip. Many older adults still like to have a paper map on hand, and they do come in handy when a major detour sends your GPS in circles. Out of the car and on foot or bike, map apps such as Map My Walk and Map My Ride are the way to go. For those traveling to foreign countries, there are plenty of apps to help you with currency exchanges and unfamiliar languages. Bravolo, which lists phrases in over 13 languages. Whether it’s tracking your activity or what you eat, there are apps to help you get and stay in shape. Johnson & Johnson Official 7 Minute Workout, which helps you find an intensity level workout that can be done using a chair and in 7 minutes. For healthy eating, the Calorie Counter & Diet Tracker by MyFitnessPal gets high ratings from users. The app’s growing database of more than 3 million foods provides information on everything from fat and fiber to carbs and cholesterol. The app also has a barcode scanner, allowing you to look up potential purchases while you’re grocery shopping. Whether you are planning to cruise Alaska’s inside passage, tour exotic Thailand or travel cross-country to visit your grandkids, managing chronic health conditions and coping with medical problems when you’re away from home can be challenging. Mayo Clinic Symptom Checker helps you decide when to seek medical help. The app allows you to tap into the clinic’s extensive online library to obtain information about countless medical conditions and diseases, including typical symptoms and recommended treatments. iTriage provides access and turn-by-turn directions to a nationwide directory of medical facilities and pharmacies. For international travelers, Emergency Medical Center Locator provides information and directions to medical facilities in 101 countries. Universal Doctor Speaker can be a godsend if you find yourself in need of medical help in a foreign country. When you select a language, a list of critical medical questions and phrases is provided. Healthline recommends Diabetes Logbook, Diabetik, Diabetic Connect and other apps to provide diabetes management tools. RxmindMe Prescription/Medicine Reminder and Drugs.com Medication Guide offer helpful medication reminders and information.